Nestled high in the Swiss mountains there remains a commune that has strived to protect its heritage. And so a particular way of making cheese has changed little during the last two hundred years. Every year, once the snow has melted and the skiers have gone home, 69 special cheese producers don their boots to make the journey up to their Alpage chalets in order to make a truly special cheese: Etivaz. The town of Etivaz sits a bit further up the mountain from the ski resorts of Gstaad and Château d’Oex. It’s only a small commune, but the residents of Etivaz have managed to maintain their Alpage way of life and ultra-traditional way of making cheese, whilst others throughout the Alps have found it hard to retain their customs and compete against larger commercial practices and advances in cheese-making. But Etivaz is special because back in 1932, thirty local farm cheese-makers decided to work together collectively to ensure their unique style of cheese-making remained vibrant. To gain strength through numbers, they set up a co-operative in the local village of Etivaz. Here they built a cave to which they could all bring their fresh cheese down from their farms, to be aged and then sold. The cave in Etivaz is run by a small team employed by the collective of farmers. 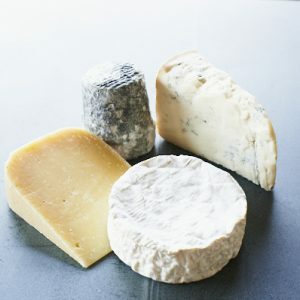 Thus the stress of maturing and selling each individual farm’s product from the farm was reduced, and they began instead to market their farmhouse Alpage cheese as a brand: L’Etivaz cheese. Over the last 85 years this co-operative has kept protected the true ideals of alpine cheese-making. Etivaz carries the torch of tradition up there in the Alps: some call it the grandfather of Gruyère. The method of production is similar to Gruyère (with the curds heated to produce the supple textures and sweet, caramelised flavours), and in tasting and texture you can see how both cheeses are closely related. But the characteristics of Etivaz stand out as different thanks to the ancient methods of production, and it is only made in the Summer months (from 10th May to 10th October) when the cows feed exclusively on the rich lush Alpine pastures all higher than 1000m (3300 feet). The cheese is made in a massive copper cauldron that hangs over an open log fire. As the fire burns brightly under the cheese cauldrons the smoke and ashes settle on the inside of the chalets, blackening the outside of the cheese cauldrons, and giving the curds a saline and smoky quality. 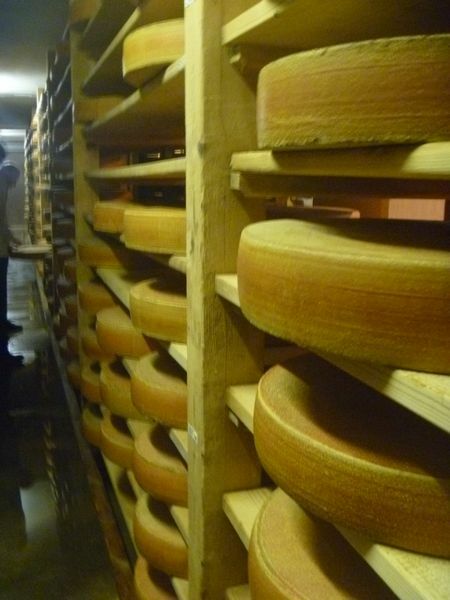 This is real cheese, of its place, and capturing each farm’s unique terroir. With the youngest maker just 21 and the oldest 77, Etivaz cheese continues to be kept alive by this co-operative of 69 different producers, working together to preserve their traditions and history and fighting against bureaucracy, hygiene demands, and cheaper, mass-produced alternatives. Etivaz is a brilliant example of how small producers (most have between 20 and 60 cows) can out-compete bigger businesses, despite their economies of scale. Frederic and Irene Chabloz make up one of these prized Etivaz producers. 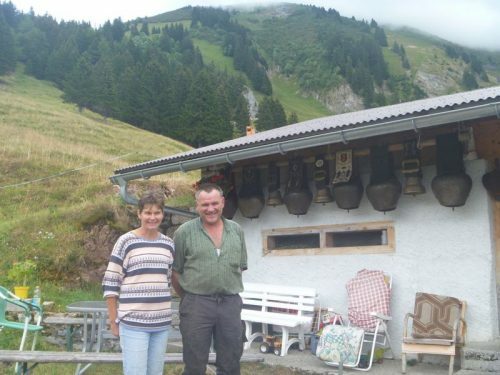 Based at 1550m high, their chalet is a 45-minute drive and a walk up the mountain from the Etivaz town and its cave. Farming just 24 traditionally-bred Swiss cows, they make only two small wheels of Etivaz each day, and only from mid June to late September (their location is too wild to allow them to continue producing into October as some of other chalets do). Their tiny chalet, hanging tight to the hillside, is the centre of their lives for those four months. Their milking parlour and cellar are on the bottom floor, and there’s a small kitchen, bedroom and cheese-make room above. Frederic’s day begins at sunrise as he brings the cows in from the mountain pasture to be milked. 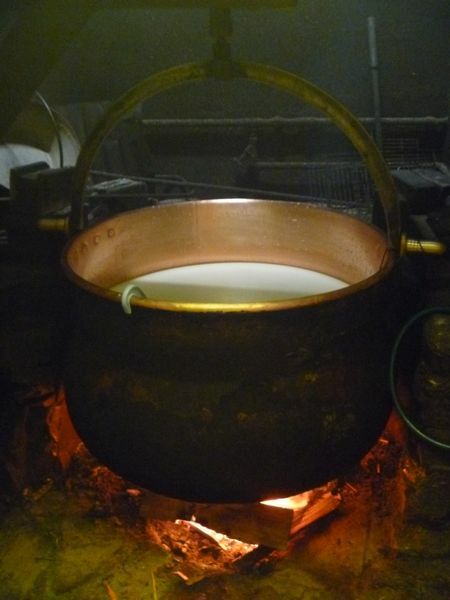 Last night’s milking already rests in open copper pans in the chalet, where the cream is skimmed off by hand. This is poured into the large copper cauldron and the morning milk, natural whey cultures and rennet are added. Once set, the curd is cut and then it is heated. Crucial to the Etivaz cheese-making is the log fire burning in the middle of the chalet (most cheese producers nowadays heat using a heated sealed vat). Frederic spends the autumn on the mountain cutting logs for his cheese fire the next year. As the fire gains ferocity, the copper cauldron of milk is swung above it. The fire crackles, and flames caress the cauldron as the smoke fills the already blackened room. Airborn ashes that drop into the vat will give the finished cheeses a faint whiff of smokiness. It’s a scene that would be familiar to cheese-makers from 200 years ago – it’s only the sound of the radio that reminds the observer that this is the 21st Century. Within a few hours the specks of curd have hardened and it is gathered up in a muslin bag before being pressed overnight in the couple’s kitchen. It will then rest a few days in their cellar before being taken down to the Etivaz cave (the cheese must be taken down before it is seven days old). It will spend at least the next year under the careful attention of the affineurs in the Etivaz cave. Once the cheese is properly aged, the master of the cave will taste and grade every one of the Etivaz cheese-makers wheels each day. 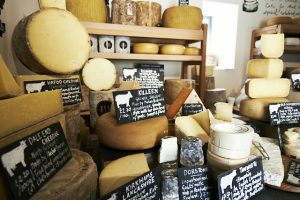 The makers are then given 10% of their production for their own use, and paid a split of the profits from the co-operative depending on the weight of cheese they contributed, and the score of all their cheeses at grading. You’ll be pleased to know Frederic and Irene got an almost perfect set of scores last year. There are cheeses that are made in a similar way to Etivaz, but none as stripped back to basics as Etivaz. To taste Etivaz is to experience traditional cheese-making at its most pure. We should seek Etivaz out – it deserves our support.